Many of our Springs Apartments residents live a fair distance from one of the most integral parts of any holiday celebration: their families. And many can’t make it home for holidays because of work schedules, the cost of travel and other obligations. If you’re one of those “transplants” who’ll be without family this Thanksgiving, we’ve got some simple tips to help create wonderful new memories while hosting a dinner that reminds you of all those holidays past. First, take note of your space. If you’re having guests, determine whether you can have a “sit down” dinner or will need to be flexible and allow people to eat from plates on their laps or TV trays. If you go the lap route, you can set up a buffet using your kitchen counters, table or island. Make sure you have easy access to enough outlets if you’ll be setting up warming trays or slow cookers. Opt for decorative paper napkins to simplify cleanup, but choose real plates, flatware and glassware; bringing out “the good stuff” is one of the things that makes an occasion special. Make sure you get a right-sized turkey. Rule of thumb: the number of people you’ll be serving is the same as the weight (in pounds) of the turkey you should buy. So, an 8 lb. turkey is just right for you and seven guests. Buying a turkey breast rather than the whole turkey can be a better option because there’s no waste (no bones to pick, either! ), though there’s no dark meat for those who prefer it. If you don’t want to spend all day in the kitchen, develop a menu based on your favorite family recipes and assign guests to bring one item. This way you’re sharing cooking duties – and the rave reviews. Along with their dishes, ask guests to bring the appropriate serving utensils; this will keep you from hunting high and low for additional spoons, spatulas and pie servers when you need them most. Creating That Thanksgiving Atmosphere. You can make your apartment feel even more like home with a few candles (don’t use scented candles on this day – allow the amazing smells of turkey, stuffing and pumpkin pie to permeate the air), some fall foliage (dried branches, acorns, artificial gourds and pumpkins, etc.) and a pinecone wreath, all of which you can find at your local hobby/craft store. And, if you don’t have a fireplace, put a cozy crackling fire on your TV. This one’s complete with a crackling log soundtrack and runs continuously for 2 hours! Connect With Loved Ones. If some of your loved ones can’t make it to dinner, organize a Skype visit. Using a laptop or tablet you can walk around the apartment to show off your culinary and decorating skills. It’s best to Skype before dinner, when guests aren’t in the midst of cleanup (or asleep!). 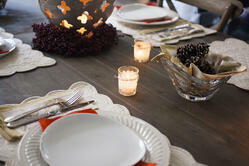 Finally, ask each guest to bring a picture, recipe or fond memory from their childhood Thanksgiving. Reminiscing will help you all feel closer to family and spark some great conversations about long-ago holidays. What are your favorite Thanksgiving foods? What about your family holiday traditions – do you still carry them on? What’s on your menu this year? We’d love to know how you spend Thanksgiving, and since a picture is worth 1,000 words, why not share one with us to show your holiday cheer?